As one of its daily deals, 13 Deal offers three Monopoly Mini Notebooks for $5.49 with free shipping. That's the lowest price we could find by $5. 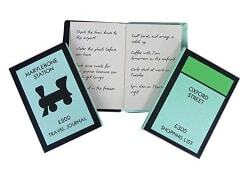 It includes Marylebone Station, Oxford Street, and Monopoly Electric Company themed notebooks. Deal ends today.